Something didn’t seem quite right. 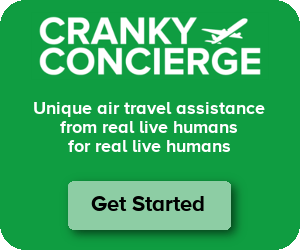 A Cranky Concierge client was booked to fly during the holidays from Orlando to Raleigh/Durham on Delta Connection. A mere three weeks in advance, Delta scrubbed the flight and instead decided to operate a mainline flight 5 hours earlier. As you can imagine, the client was not happy. (We got a refund and rebooked him on Southwest.) Even though Delta is known for having an insanely frustrating number of schedule changes, this seemed like a new low for the airline. Upon further review, it looks like Delta didn’t want to do this but is instead scrambling to backfill flying its regional partners can no longer handle. There appears to be one culprit in particular. We’ve talked about how Republic has been having trouble finding enough pilots. Now that it has a new contract with the union, it was hoping the higher rates would attract more people to fly, but that’s not a given. More importantly, it’s not going to happen overnight. So it shouldn’t be much of a surprise that the flights that are causing Delta trouble are those that are supposed to be operated by Republic and its subsidiaries. It was two months ago that Delta filed a lawsuit against Republic for not being able to operate the flights per the contract. At the time, Republic said it hasn’t violated the agreement, but it was very clear that it needed more pilots than it had. It’s my understanding that airlines had already pulled down schedules for some regional flying, but even that wasn’t enough in Delta’s case so it had to make last-minute changes. How bad is it, really? I don’t have a full list of flights, though there is certainly more than just Orlando to Raleigh/Durham. (That route doesn’t go back to normal until January 2.) There does appear to be one route getting hit harder than any other. To see where things have really gone off the rails, check out Dallas/Ft Worth to New York/LaGuardia. This is a route that’s usually operated by Shuttle America 6 or 7 times a day. But right now Delta is limping along just trying to fly half that schedule if it can. It looks like someone in Delta’s scheduling department gave his kid some egg nog, a bunch of numbers, and an assortment of aircraft types and just let him do whatever he wanted. The reality, of course is that Delta is scrambling to find ways to route its airplanes (and those of Endeavor) in ways that will allow it to cover a minimum schedule. That means that other markets are facing changes as well in order to help accommodate this new schedule. For example, we had another client flying Atlanta to Nashville this week and a flight was inexplicably canceled a couple weeks ago. I can only assume that’s an airplane that needs to be used to cover other flying. This has been a mess, but Delta is at least trying to do something. Naturally, I can’t get anyone to really talk about this on the record. Since Delta is suing Republic, it won’t comment. But regarding the broader issue of last minute schedule changes, Delta said that it “regrets the customer inconvenience” and “we do what we can to minimize disruption.” I asked Republic for comment and did not get a response. This appears to be really bad through the end of the year. After that the impact lessens. Hopefully Republic can at least continue to operate what it has left at this point. But this is certainly something that should cause concern. And yet this won’t touch Delta by the industry-standard measurements of operational efficiency. Is there some accepted benchmark for reliability that incorporates schedule changes for already-ticketed flights? Yup there is but it’s not an issue. They can cancel a flight 168 hours (7 days) before it operates without penalty. Within that week it’s a cancellation penalty. So there isn’t a way to switch from mainline to connection, or to upgrade two flights into one without a penalty. You reap what you sow…the major airlines decided in the 1980’s to have code-share partners called commuter airlines fly the shorter flights, this outsourced flying was put to bid to the lowest cost…which in part was achieved by paying those pilots ultra-low wages ( in many cases these pilots qualified for food stamps)….FFW to 2016..=the commuters became regionals…the CRJ-100 was invented and today they do about 50% of domestic USA flying..the pilot pay is still crummy, flight school enrollment is at an all time low, military pilot retirement is very low too, and many of those pilots that got fed up with low regional pay went to QATAR, EMIRATES, ETIHAD or airlines in china and asia that pay 20x better. Yes, I recall the “good old days” when you could fly mainline metal into any 2 bit town. Flew on 727’s into cities that can’t even get CRJ service these days. I for one would take far less frequency and upgauging the aircraft over the frequent flights and head knocking cabins of the CRJ’s. Good for you. If rather be able to leave the office on a Friday and fly to New York for the weekend without having to take any time off, which wouldn’t happen with less frequency. Excellent response and so true. What really annoys me are all the mainline airline jobs lost because of the greediness of the majors to use regionals. There is absolutely no connection between the two when it comes to hiring, benefits and salaries. On top of that was mass confusion by passengers (usually when it was too late) that they were not on mainline aircraft but on prophets and 50-seaters going nowhere at the first drop of rain or gust of wind. Republic should be suing DL and other majors that “uses” them. oops, correct spelling – prop-jets, not “prophets”. Living in RDU and taking that MCO flight often, on a CRJ9, its so odd to see a 757 subbed for tomorrow’s afternoon flight. Greg J – Well it’s funny because there is still a CR9 operating most days by Endeavor. The other flight, at least during the holidays, was on an ERJ and that’s the one they killed and replaced with a mainline jet. So it’s quite the upgauge on some days! I’ve got JFK-DCA coming up in January… was sked on Endeavor CRJ900 and recently changed to 30mins later and and A319 that will overnight in DCA now. Delta used to be only CRJ7/9 on this route, other than a B717 this summer. All the pay in the world won’t hire pilots that don’t exist. I’d bet good money that the regionals already have a collective demand that outstrips supply. It’s hard to see how even a large increase in pay will attract people to an industry that demands a 4 year degree and 1500 hours. That’s just an enormous cost to finance before earning a return. Not to mention eventually they’ll steal pilots from other countries. Please investigate Gojet operated flights for United Express. u600213 – I don’t know about advance schedule changes, but yeah, that’s bad performance. Since November 1, GoJet has canceled nearly 8 percent of its flights for United with just over 67 percent of flights arriving within 14 minutes of schedule. That is BAD. It’s even worse if you just look at December. Nearly 15 percent of flights canceled and only 54.6 percent arriving within 14 minutes of schedule. GoJet has many issues but since Dec they have outsourced parts of the dispatch procedure to a foreign company. This has caused HUGE issues as final numbers before pushback are a slow and painstaking long process. It will improve a little as time goes on but this is once again an example of short sighted thinking on airline executives, as the extra “layer” of coordination between the company and dispatch will always present itself as further issues present themselves. I just booked a flight on American, PHL-ATL, operated by Republic as American Eagle. Do I have to worry? Cranky, I was wondering the same thing. Is Republic’s pilot shortage disproportionately impacting DL? Not sure if the lawsuit would make them more cautious with the DL schedule or the opposite, since they are already being sued. AFAIK. Even though Republic flies for AA, UA? and DL, Republic staffs each airline as separate work group. Please correct me if I’m wrong. Nope, you are completely wrong here. They are staffed by certificate Republic/Shuttle and then by aircraft type Q400/EMB170/75/EMB145. A pilot qualified on the 170 for the Republic certificate could work an AA flight that and a UA flight tomorrow. A 170 pilot on the Shuttle certificate could work DL today and UA tomorrow. A pilot on the 145 only works DL because that is the only active contract for that aircraft type. But when that aircraft type was flying for 5 codeshare partners at a time, the same crews worked for all of them. owen – Well, they don’t appear to be having as much trouble operating flights that remain scheduled. They just are letting Delta (and maybe others, not sure) know that they can’t operate some flights in advance. If you look at Republic’s American operation, it’s not the best performance, but it’s not the worst. Well that’s what happens when you try to be to big and use other company’s to handle a big chunk of your business, if they have problems, you have a bigger problem and pay the price. Delta knew full well that when it renewed the 50 seat flying with Republic that there were going to be problems. Now it’s paying the price with Republic crewing and scheduling problems and wants Republic to cover the costs by suing them. Delta does not want give it’s customers mainline planes and to pay it’s pilots to fly these regional routes. Eventually all Legacy carriers are going to have to do it as the influx of new pilots diminish. Except Republic knew when it brought on more flying from American (and United?) that Delta had the right to extend the 50 seat flying at its exclusive option. They expected the option not to be renewed based on Delta’s public statements, but they didn’t go to Delta and get a contract amendment removing the option. From what I’ve heard Delta wasn’t too happy about this lack of appropriate communication from Republic. I’m sure they checked given the lower fuel prices the 50 seater flying was profitable, but screwing Republic over by renewing the contract was icing on the cake. Cranky, are you sure the odd schedule this isn’t just holiday scheduling? Especially in a market like LGA. The late changes though, that definitely sounds like Republic not being able to fly their schedule. Ken – Yes. Holiday schedules were done awhile ago. If you look, they’re using flight numbers for mainline flights in the 8000 series. That’s not a normal scheduled operation. Nothing to see here but a good ol’ peeing match between DL & RP. One is a Doberman & the other is a chirpy little Chihuahua. If the CEO of Republic didn’t hold out 8 years of negotiating Republic’s pilot contract there would be less of an impact today. Even with the new contract Republic pilot pay is only within a dollar more than it’s competitors. And for the love of God don’t just look at 1st year pay, but all years of service. Some of the Republic pilots only received a $0.01 increase in hourly pay. The increase in pay rose higher in the first few years and then dropped off considerably for its senior pilots. Republic’s 2015 holiday bonus … $100! 2014 holiday bonus, $200/year of service. However Republic is renting the Colts stadium for its 2015 holiday party and offering $20,000 sign on bonus for new hires. No wonder Republic is losing pilots left and right to Spirit/jetBlue. Bam! U must be a fellow employee! Not up to him. DL rolled over their 50 seat contract. Bedford was banking on DL winding down the 50 seaters and DL called him on it. Now both are paying the price. You can largely blame the FAA and Congress for significantly changing the number of flight hours a pilot needs to operate Republic’s flights (and flights of other airlines smaller than the majors), a knee jerk reaction to the B-1900 crash in New York. Not sure just what the base number was before, but the current 1,200 hours is significantly more than it used to be – consequently, fewer qualified pilots. Republic is not the only one where this has caused a major loss of available pilots. And let’s face it, starry eyed, wet commercial pilots do not belong in a 121 flight deck. I speak from experience. I had ZERO business up there until I accrued some experience. You may be correct in your assessment that you were not ready but how do you propose we fix this pilot shortage. It ain’t coming its here and will only get worse. May I remind you that both pilots in the crash had over 2000 hours. First, as someone who lives in Orlando, and travels Delta often, the Orlando to Raleigh is not operated by Republic Airlines. Further, Republic Airlines does not fly for Delta at all. Due to legal limitations, i.e. pilot scope clause limits, only Republic Airways Holdings, Shuttle America division flies for Delta. As has been previously mentioned, Delta has repeatedly, publicly stated they wanted the removal of 50 seat aircraft. Why in the world at the last minute they decided to extend the 50 seat contract is puzzling. One might believe it was purposely done to inflict staffing/operational issue. All domestic airlines, major and regional are aware, and have been for some time of the imending pilot shortage. They knew over 5 years ago as the retirement age was raised from 60 to 65 for pilots. As a travel agent, I can also share that Delta routinely cancel and changes routes. I reissue more tickets for Delta than any other airline. I just recently noticed they added an Orlando to Miami flight daily on a md-88. Wouldn’t be schocked if it gets cancelled within 2 months. AFAIK, part of the reason that Delta extended the 50 seat aircraft flying was because fuel prices had dropped which made that flying more economically justified. Although, I’ve also heard that they weren’t happy about Republic pulling on more flying for other airlines that’d use the pilots from the 50 seaters. hope everything will be okay..